Today, the great Notre Dame cathedral in Paris caught fire and burned. 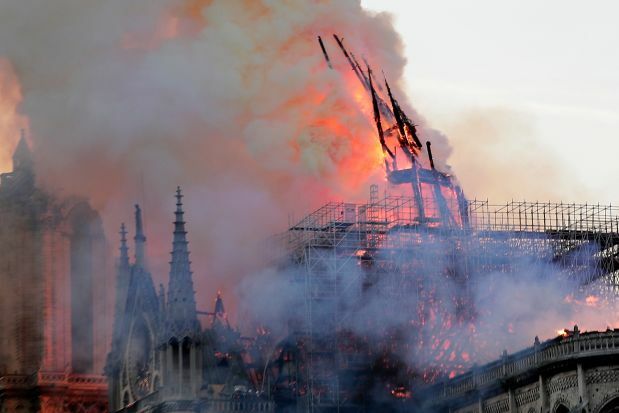 Images of the flames engulfing the monumental 12th century have flooded the internet and the world is understandably mourning the loss of such a venerable and historic landmark. The historic steeple succumbed to the flames. As I’ve been watching some of the coverage of the tragedy, I’ve been reminded of the words to one of my favorite hymns, “Built on the Rock.” People have been grappling with how to express the feeling of loss and sadness over an edifice that has stood for over 800 years. Notre Dame, like other cathedrals of Europe, stand as enduring reminders of the faith that built them. Throughout the centuries, God’s people have created beautiful structures for the worship of God and as reminders of His majesty and greatness. When you look at a place like Notre Dame in the modern world, it’s hard to imagine how it was built by medieval human hands starting in 1160. But it’s also hard to imagine places like Notre Dame not being there. These massive structures have stood through the centuries. It seems invincible when you think about how many generations have come and gone in it’s 856 years. And yet, in a moment we are reminded just how temporary even massive cathedrals can be. In the hymn, “Built on the Rock,” the author Nicolai F.S. Grundtvig reminds us that the church is not the building – no matter how grand or permanent those buildings may be. We can admire the great houses of worship built by human hands – those built centuries ago or those with paint that’s still drying. But our hope is not in buildings built by the hands of man. They are in the God who made the stones, the wood, and everything else that went into the construction of those edifices. The God who gifted men and women with the ability to create such beautiful and awe-inspiring places as Notre Dame is the God who also gives us Himself and who takes up residence within each of His children, making our bodies His temple. It’s incredibly sad to see what is literally one of the world’s great treasures engulfed with flames and know that an irreplaceable part of our collective history is lost. But perhaps it’s fitting that it happened this week, at the start of Holy Week, to remind us what is really important. Steeples have fallen today. Spires have crumbled. But the church of God still stands on the Rock of Jesus and His resurrection for us.